CALGARY, Alta. 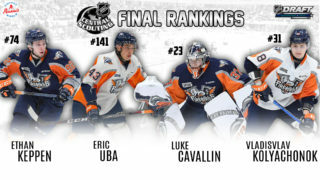 – Flint Firebirds’ forward Ty Dellandrea is one of 16 OHL players, and one of 40 of Canada’s top junior hockey players, that have received official invites to the Sport Chek World Junior Showcase in Kamloops, B.C., July 28-Aug. 4. The eight-day Sport Chek World Junior Showcase is the first step for nation’s top junior players to make the final roster for the 2019 World Junior Championship this Dec. 26, 2018 – Jan. 5, 2019 in Vancouver, B.C. The IIHF Ice Hockey World Junior Championship (WJC), commonly known simply as the World Juniors, is an annual event organized by the International Ice Hockey Federation (IIHF) for national under-20 ice hockey teams from around the world. They are traditionally held in late December, ending in early January. The tournament attracts the world’s top hockey players that are 18 and 19 years of age. However, some NHL teams do not release their top players as the tournament overlaps with the NHL season. 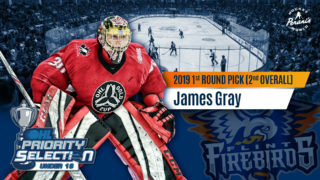 Dellandrea, a six-foot, 190-pound forward from Port Perry, Ont., became the first Flint Firebird to be selected in the first round of the NHL Draft when he was tabbed by the Dallas Stars 13th overall on June 22, 2018. He totaled 59 points (27G, 32A) in 67 games during the 2017-18 regular season with Flint. 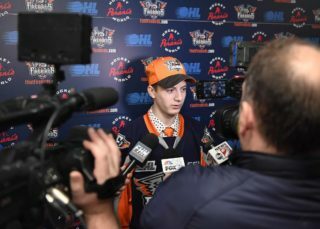 After being selected by the Firebirds in the first-round, fifth overall, of the 2016 OHL Priority Selection, Dellandrea was named an assistant captain in his second season in Flint. He recorded five game-winning goals and 14 multi-point games during the 2017-18 campaign, including a five-point (3G, 2A) night on Dec. 16, 2017. On the international level, Dellandrea is no stranger to Hockey Canada’s Program of Excellence (POE). He was one of just three under-aged players to be selected for Canada’s National Men’s U-18 Team for the 2017 IIHF World Championship in Poprad and Spisska Nova Ves, Slovakia. He also played a key role on Canada’s National Men’s Summer U-18 Team that claimed gold at the 2017 Ivan Hlinka Memorial Cup in Břeclav, Czech Republic and Bratislava, Slovakia in August. Most recently, Dellandrea tallied five points (2G, 3A), including a plus-5 rating in five games, and was named an assistant captain for Canada’s National Men’s U-18 Team at the 2018 IIHF World Championship in Chelyabinsk and Magnitogorsk, Russia. The showcase features Canada, Finland, Sweden, and the United States who will combine to play 11 games at the Sandman Centre. Canada will dress two squads for games against a split Team USA on July 31, before combining again as Team Canada to play Finland on Aug. 2, Sweden on Aug. 3, and close the mini-tournament against the United States on Aug. 4.